But here’s the deal, he had taken chicken breasts out of the freezer in the morning and had planned on grilling them with one of his usual marinades. But, when he went to the cupboard to get it, a can of artichokes hearts caught his eye. We love artichokes. So, like he often does, he logged onto one of his favorite recipe websites, allrecipes.com, and typed in chicken and artichokes. 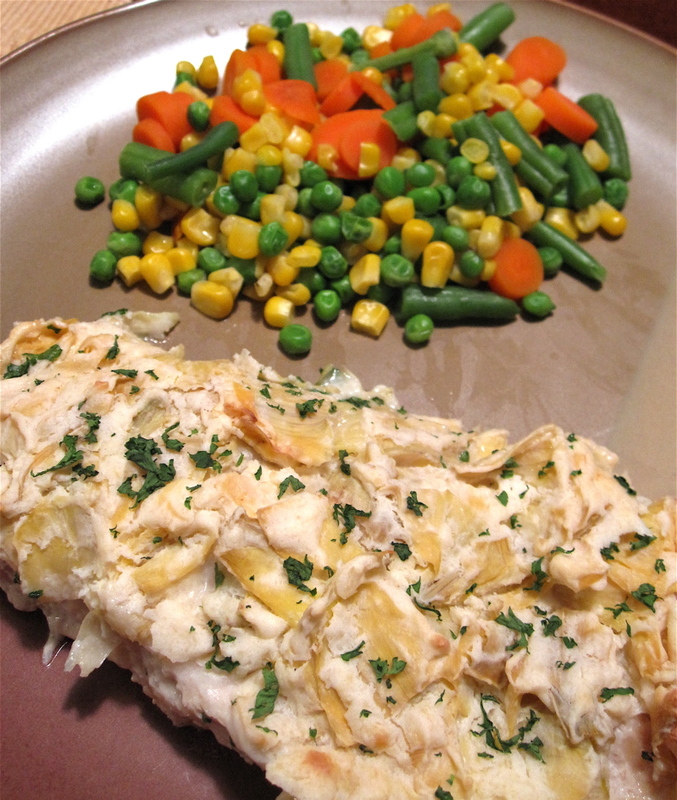 One of the first recipes listed, cleverly named no doubt, was Artichoke Chicken. It had more than one thousand reviews on it, which my husband loves, so he decided to give it a shot. However, he knew that the recipe wasn’t all that healthy, so he took it upon himself to revise it. That, my dear readers, is where the shock factor comes in. I entered the information for the original recipe into the recipe builder on the Weight Watchers website to find out how many pp values it had. I put the serving size as three because that is how many chicken breasts my husband used. Each serving had 21 pp values. TWENTY-ONE!!! Holy smokes. I only have 30 pp values to use in a day. To waste 21 pp values on one piece of chicken, not a chance. That is ridiculous. Absurd, really. Well, my husband’s revised version of the chicken artichoke recipe, which I cleverly renamed Chicken A la Artichoke Al, was only 7 pp values per serving. SEVEN. Now that’s more like it. Seriously, to go from 21 to 7 pp values, that is absolutely crazy. Unbelievable almost. You can find the original recipe here. The ingredients included 1 can of artichokes hearts, drained and chopped; 3/4 cup of grated parmesan cheese; 3/4 mayonnaise; 1 pinch of garlic pepper; and 4 boneless, skinless chicken breasts. For instructions, click on the link. The ingredients my husband used included 2 wedges of the Laughing Cow light original swiss cheese; 3 tablespoons of reduced-fat parmesan cheese; 1/4 cup of fat-free sour cream; 2 tablespoons of Hellman’s light mayonnaise; 1/2 tablespoon of garlic powder; 1 can of artichokes hearts (not in oil), drained and chopped; 2 tablespoons of fresh parsley, chopped (tossed on top once it was done); and 20 ounces of chicken (this was one package, but it only had three chicken breasts). He mixed together everything but the chicken breasts and the parsley. Then he sprayed a glass pan with Pam and put the chicken breasts in the pan. He took the mixture and spread it evenly over the three chicken breasts and baked it, uncovered, for about 45 minutes at 375 degrees. When he took it out of the oven, he sprinkled the fresh parsley on top. So, I am sure all of you are wondering if the recipe my husband made was even any good and you know what, it was DELICIOUS! And I am not just saying that. It was creamy, cheesy, flavorful, tender and just plain good. We ate it with a side of mixed veggies and it was a wonderfully delicious meal. And the best part? It was way more healthy for us!!!! It just goes to show you that you can tweak a recipe just a little and it can make a huge difference, as far as how healthy it is. And you can do it without sacrificing the taste. Here’s a photo of the Chicken a la Artichoke Al! !